It is our favorite time of the year! Camp is in full swing! Heartland is busy hosting youth, parents, leaders and counselors at a variety of day camps and overnight camps each week. 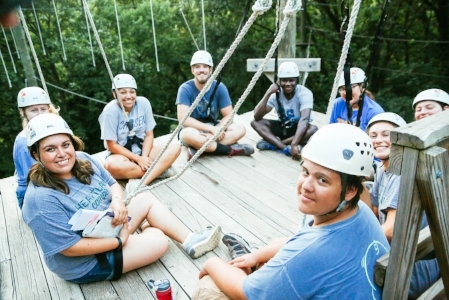 At the same time, guest groups continue to participate in retreats as well as a variety of other activities. As usual, there was great participation in our Grand Camp, where grandparents bonded with their grandchildren and everyone had a fun time. One family comes from California every year to take part in this special event. The camp staff this year are dedicated and caring people who strive to make a difference in the lives of the youth who come to camp. Your continued prayers and financial support are appreciated as we provide this unique opportunity for all concerned to continue on their spiritual journeys and grow in faith. This summer Heartland Camps has the privilege of a few hosting international staff! Four people from overseas are participating in summer activities with us. Long Xiao is from China and currently a student at Pittsburg State in Kansas. He has chosen to spend his summer here at Heartland as an overnight-camp counselor. Amy Li is from Hong Kong and also is a student at Pittsburg State in Kansas. She is working as a summer staffer on the media team. Christi Swart from New Zealand came to explore the States and experience an American summer camp. New Zealand does not have comparable camping programs. She is helping with day camp. Sophia Sunberg is an American but her parents are long-term missionaries in Budapest. She also help as a day camp counselor as she prepares for college in the States in the fall. Campers are saying . . . This summer's camper comments are coming in. They report having a great time! It is awesome. I loved it. It is amazing. It was an awesome experience. Favorite things about camp included listening to all the birds tweet and making new friends. Favorite foods included hot dogs, s'mores, pizza and chicken fingers. The most enjoyed activities have been horseback riding and swimming. The young people attending camp repeatedly comment that they have learned more about God and God's love for them--a core part of the mission of Heartland.